This is the last USB turntable with a ceramic cartridge I'm planning to test for a while. Next, I plan to move up the ladder and get samples from DJ USB turntables. I felt it was important to demonstrate a second ceramic to show that the Crosley's poor performance was not an anomaly. And boy do I have some poor performance to demonstrate! I picked this turntable because several companies sell the same record player under different brand names. Grace Digital Audio, Memorex, Technical Pro, firstStreet and Innovative Technology have all claimed this USB turntable as their own. 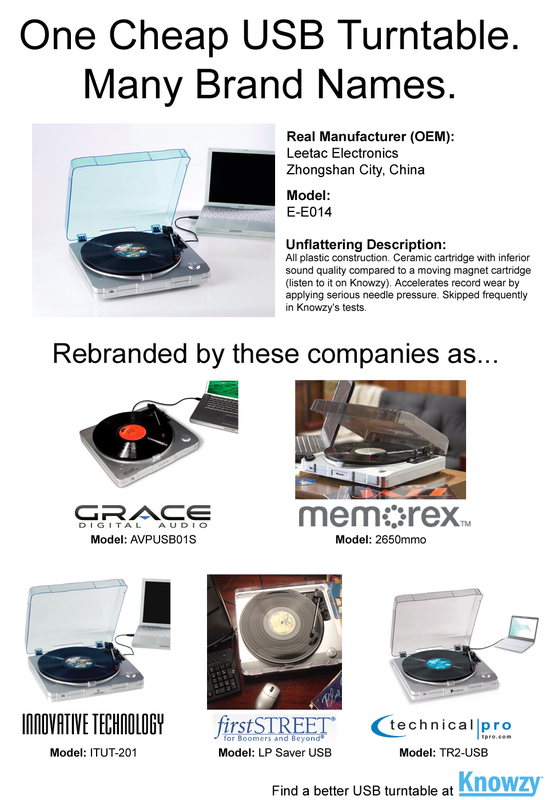 I traced the turntable back to a Chinese manufacturer called Leetac Electronics. If you order at least 1,000 of them, you can slap your own logo on this USB turntable. I attempted to get pricing from Leetac but no one returned my e-mails. The Grace AVPUSB01S arrived with a bent stylus and ruined my 30th anniversary presses of Aja and Dark Side of the Moon. 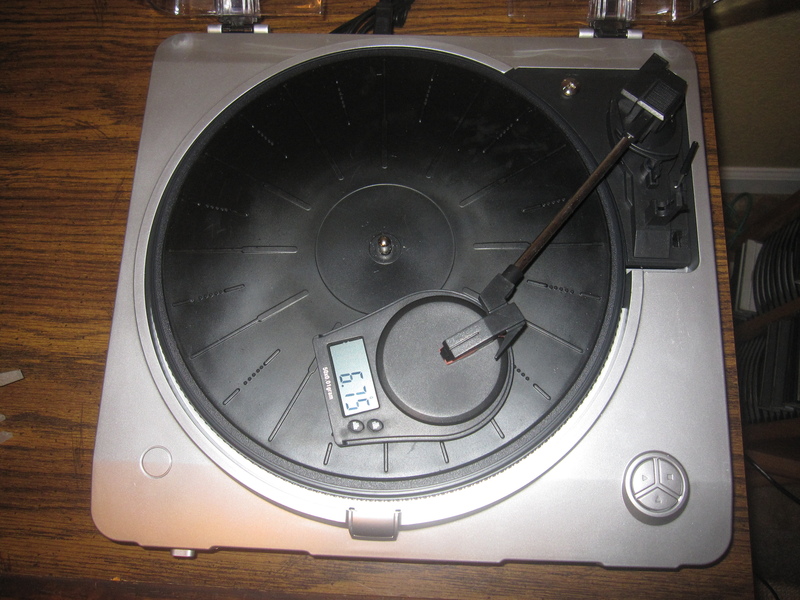 Read about the long journey to getting a working Grace turntable in the previous post, "Proof That a Ceramic Cart Damages Record with Single Play*." 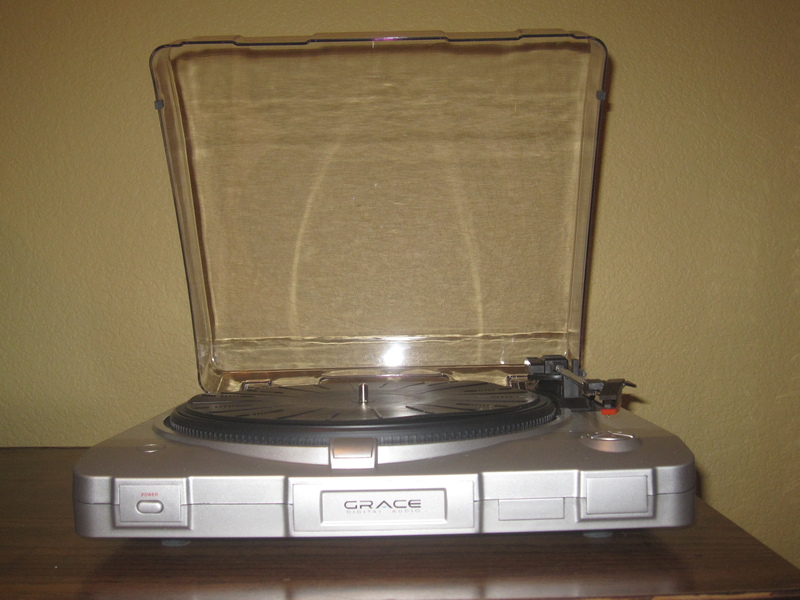 The sound quality from the Grace is predictably poor, roughly on par with the Crosley. What surprised me was how badly it skipped. Several music tracks I played skipped at least once. But the Gorillaz track was comically bad: It finished the four minute song in a minute and 8 seconds, skipping forward on every beat. The Crosley had trouble with the Gorillaz track as well. It's turning out to be an excellent test case. The combination of an album recorded hot and bursts of low frequencies seem to make a perfect recipe for skipping. I had a second, new stylus, so I tried the Gorillaz track with it. Same result. Tracks 6 – 9 on HFN002 play a 300Hz tone at increasing volume levels- +12dB, 14, 16 and finally +18dB. The Grace handled the 12dB fine. Anything louder and it skips to the end of the track almost immediately. Also notable (maybe related? )- The turntable exerts a whopping 6.75 grams of vertical tracking force on the record. As mentioned in the previous post, I believe the max for this cartridge is 5 grams. Turntable folklore would have you believe this extra force would reduce skipping- the equivalent of taping a penny to a headshell holding a gentler cartridge. The pressure didn't seem to be an asset with the Grace turntable. After spending all this time near the bottom, I am very much looking forward to moving up the turntable food chain. 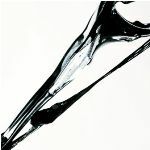 Concerning the test disks, I’ve listened only to the silent groove. And I’d say “not bad”. The best music track for me to evaluate the quality of reproduction by your cartridge was “Peg, Steely Dan, Aja”. I’d say it sounds good, but with a considerable “roll-off” of highs above 10 kHz. But it’s not this that worries me, but your continuing practice to play your vinyls with ceramic cartridges with 6,75 g tracking force! To save what can still be saved on your disks, I’d recommend you to “switch over” to MM cartridges with tracking forces of about 1,5 to 2,0 g, or 2,5 g at most, as soon as possible. Thanks for your detailed tests, Knowzy. I always look forward to reading them. But it's not this that worries me, but your continuing practice to play your vinyls with ceramic cartridges with 6,75 g tracking force! To save what can still be saved on your disks, I'd recommend you to "switch over" to MM cartridges with tracking forces of about 1,5 to 2,0 g, or 2,5 g at most, as soon as possible. I hear you. These records are no longer reliable for testing. I plan on replacing all of them for my next round of tests on better turntables with MM cartridges. You're welcome. I'm glad they're appreciated. I would also like to commend you for your superb, absolutely invaluable (and apparently indefatigable!) efforts Knowzy. The lack of rigorous testing of USB turntables is scandalous given the resurgence in interest in vinyl. If your testing is more widely disseminated perhaps we'll witness manufacturers producing products of acceptable quality! I am certainly glad Knowzy takes the time to do this; it's because of that I ran screaming away from usb turntables! To be fair, $100 turntables in general tend to be pretty shoddy- USB or otherwise. If that's your budget, avoid the ceramics and cross your fingers! HA's wiki on pricing is quite accurate despite being a little out of date. In the high $200's, you start finding turntables that don't feel like they're going to fall apart in your hands if you pick them up. Those are the ones I'm going after next. And I'm going to try my hand at 78s while I'm at it. Note that even high end audio ragazines that publish pretty fair technical tests of other audio products, slough off testing vinyl playback gear. Pretty much universal in the industry. That is what happened to most categories of audio gear. Of course, vinyl is pretty much a dead art, and its inherent limits are so intractable that after 10 years or more of messing around, the industry jumped to digital. However, this USB %$#!! seems to vastly understate even the limited potential of vinyl. People would be better off picking up a working used Dual 1219 from their neighbors garage sale or eBay, carefully installing a Shre M97Xe, and hooking it up to the phono inputs of a legacy receiver. 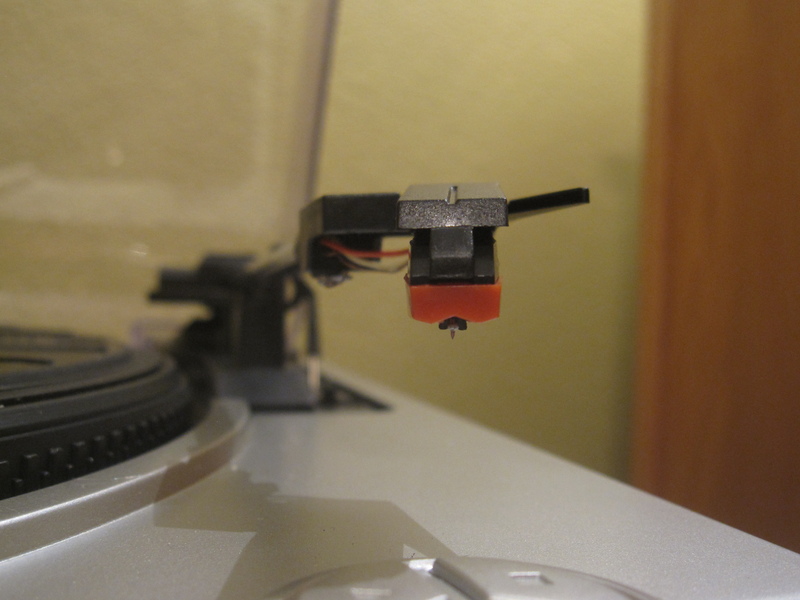 The problem with that plan would be the difficulty for a vinyl newbie of properly installing that new cartridge. There are two links on each line. Click on the "LP" part. Just joined - not sure if this is best spot for my post but it pertains to this Grace Digital turntable. Unfortunately, it is out-of-warranty. It is pristine because it has barely been touched. I purchased it to get some vinyl onto CDs for the car. Due to time constraints, I just started the process now. 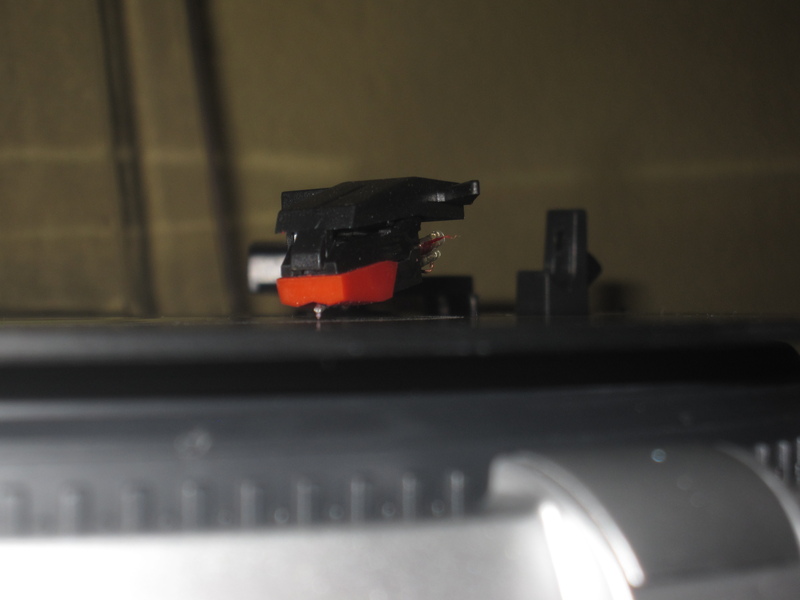 Anyways, my problem is that the tonearm will only sit on the record for less than a minute before it auto ejects. It doesn't look like this is an isolated problem because there are similar reports of this on the Grace Digital support forum. Are there any turntable experts who can direct me on a fix? There must be some kind of adjustment for this. I don't even ccare if the auto return can be disabled so I can run it manually. 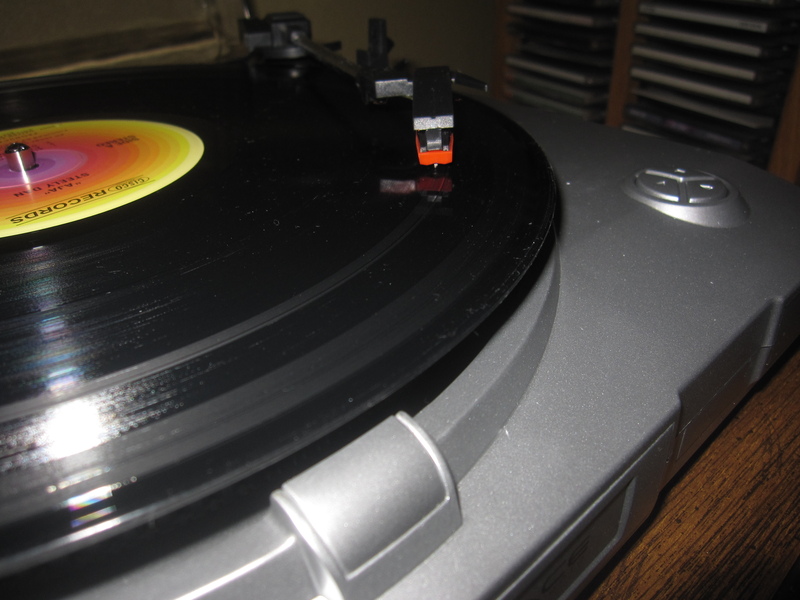 What I don't understand is why people think that USB turntables were invented to be used to record Vinyl disks. Their main use was to be used with DJ-like programs, with special Vinyls that acted as a controller for the digitally played songs on the PC. Because that's the way they are marketed. No, you're referring to USB "controllers", such as this - I don't think too many people would look at that and think they would "just" plug it into their PC to play a 7" they got from some local band. Also, the whole point of the encoded control records used with programs such as Serato's Scratch Live is that you can use a conventional turntable (even the mighty SL-1200 if you so desire), and just hook its outputs into one of the Serato USB interfaces - it reads the audio (timecode) from the turntable and converts it to whatever format Serato uses and sends it over USB. There are many "USB turntables" out there being marketed as just that - record players that you can plug straight into your PC with the sole intent of digitizing vinyl...that so many of them do such an atrocious job of it - and even ruin the records themselves in the process - is why Knowzy's work is so necessary and appreciated. The ones with belt drive were obviously not meant for DJ use. Thanks, Knowzy. I'm looking into turntables for the first time, and it seems that your site should be just what I need. No. I am NOT referring to that at all. I didn't know that already existed for PCs, but it's just a natural evolution, I guess. I have used that on the past on CD decks connected to a mixing desk. Ok, I've read a bit more about this, and I will have to clarify my sentence. USB turntables, back ten years ago, where mostly useful in the context that I've said, in programs like BPM studio, Atomix MP3 and others that I can't remember any longer (audio mixing programs). The turntable became the controller of the program, so that one didn't have to use a mouse to do so, only to queue songs. Fast forward to today, I've seen that the USB turntable market has had an evolution, and there are two segments of USB turntables. One for audiophiles (truly for digitizing, and expensive like the audiphile market likes to be), and one for DJing which is not a simple controller any longer. And then, there's the consumer market too, which i could only describe as to "play with Vinyls". The problem is that usually, when I read people posting here at hydrogeaudio, it looks like they are asking for consumer grade, expecting to be audiophile grade. In some way, I was not aware about this evolution, so I definitely didn't understand why there was this increasing momentum on ripping vinyls with USB turntables, but what I see clearly is that if anyone wants to seriously digitize a vinyl, the entry point is still on the hundreds. Can you control the USB interface on the turntable end? As in, setting sampling rate, etc. Could you tell us what kind of controller resides insider the turntable, possibly with some debug info, how the chip identifies to the host, etc? It uses a cheap ADC chip like the one used in cheap external USB soundcards, probably. In any event, I'd be interested in what kind of electronics they used in the USB/ADC section. I don't understand why anybody of sane mind and healthy constitution would test a record player with a CERAMIC cartridge. I have been interested in HiFi - to give it its proper name - since the late 1960's, when I bought my first Braun record player with a magnetic cartridge. Even then everyone who played records knew that ceramic cartridges were utter dreck. So why waste anybodies time here to draw attention to dreck? Profiling yourself? I guess he has too much free time on his hands. And it forced me to be nasty again and having to respond to a post that makes absolutely no sense.